Poor Katie was forced to sit through a typo-filled webinar. 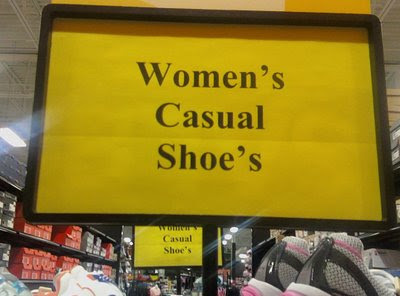 I think she deserves a raise for capturing one of the worst (and most ironic) mistakes and sending it to Apostrophe Catastrophes. She hopes that the moderator is not the one doing resume reviews. Also, could that PowerPoint slide be any uglier? 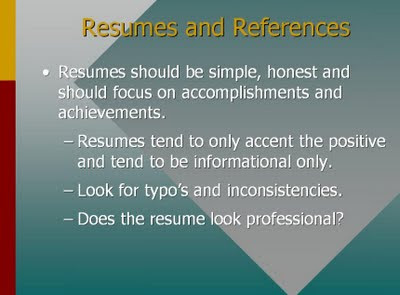 You need not take computer classes to produce better Powerpoint presentations. While it isn't technically necessary, I prefer to include the accents in résumé so readers don't think I'm talking about starting something up again. If you want to resume working, send in your résumé. Someone appears to have stolen the apostrophe from this Greyhound advertisement in Boston's South Station. In addition, I wouldn't include a period in that catchphrase. Thanks to Kami, formerly my boss's boss at my previous company, for sending this in via BlackBerry! Andrew sent an apostrophe catastrophe from Swansea, Wales, with the following introduction, "Excel Parking Services Limited appear to excel in bad punctuation." Look for the word motorist's near the bottom of the sign. They also appear to excel in verbosity! Could there by any more parking regulations on one sign? If only one Jackson lived at this house, it could be argued that this sign is OK. More likely, it's referring to the Jackson family, so it's a catastrophe. If you are talking about more than one member of your family, don't add an apostrophe to make your name plural. Sadly, this is a fairly common error. I even saw it recently on the cover of a photo album in a co-worker's cubicle. Right: The Jacksons live in that house on the corner. 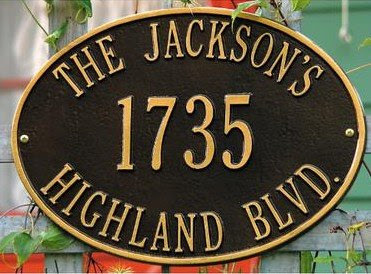 Right: This is the Jacksons' house. Wrong: I am going to hang out with the Jackson's. They have a sweet pool! Thanks Charles and Mrs. Charles! The biggest news story in the world today is the arrest of Harvard professor Henry Louis Gates Jr. Earlier this week, Cambridge police were called to Professor Gates' home when a passerby reported that two men were trying to break in. Turns out that one of the men was Gates, who lived there, and his front door was jammed. Everyone is weighing in on this issue, even our president. Was the arresting officer racist? President Obama said that the Cambridge police acted "stupidly." For the purposes of this blog, the important question is, did the Cambridge police write stupidly in the police report about the incident? There are a couple of missing commas and places where the punctuation should be inside the quotation marks, but overall, this report is pretty well written. The one glaring error is a your/you're confusion in one of Gates' quotes. I'm certain that the scholar meant to say, "You don't know who you're messing with!" Still, this police report was better than I had been expecting, so, the jury's still out. I'm sure we'll hear plenty more about this story in the next few days. It even made the homepage of the London Times online, along with Amy Winehouse's latest antics. 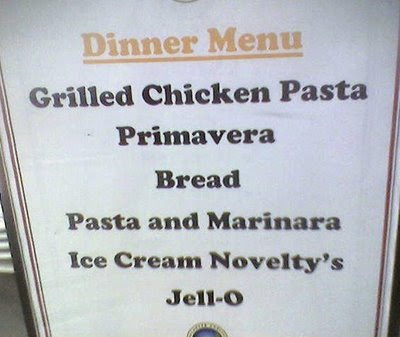 My cousin Joe found this apostrophe catastrophe in the cafeteria of the Pomfret School. Also, is that supposed to be grilled chicken and pasta primavera? I think we might have some line-spacing problems here, too. 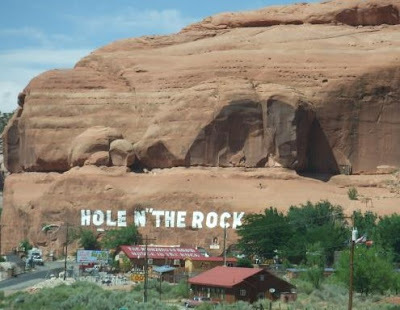 Eric, who sent us the gorgeous photo above, says he thinks that sign is supposed to say "Hole in the Rock" (not "and"), and the restaurant's web site proves him right. If the quotation mark were an apostrophe, this sign would read, "Hole No the Rock," which doesn't really make sense. While Eric reports that Hole N" the Rock was consistent with its bizarre quotation mark/double apostrophe throughout, the web site sometimes calls the place Hole "N The Rock and sometimes Hole N" the Rock. Clearly, the people who designed the signage and web site for this place hit their head on rocks in Arches National Park a few too many times. 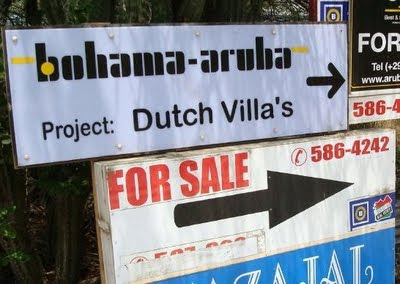 Well, at least based on their badly punctuated sign. Thanks to Josh for sending in this photo from Sports Authority in Eatontown, N.J. If you don't understand the title and first line of this posting, watch this video immediately. By the way, betch, it never gets old. 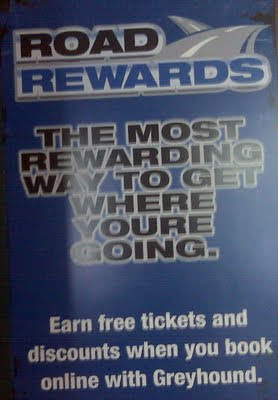 See if you can find the apostrophe catastrophe amidst all the text on this gas station sign from Allentown, Pa. Hint: David writes, "Read literally, it says, 'Containers should never be filled while inside a vehicle or it is trunk.'" 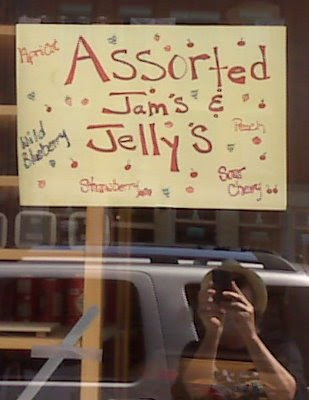 I bet the jams and jellies at this shop in Portland, Maine, are delicious, but the apostrophe catastrophes take away my appetite. Thanks to Norman for sending in this photo! 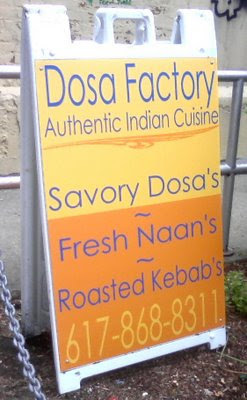 This sign in Central Square (Cambridge) caught my eye because it features three apostrophe catastrophes. But then I realized that I was hungry, so I went in and got some pakoras. I forgive you, Dosa Factory. I have a new favorite punctuation vigilante. 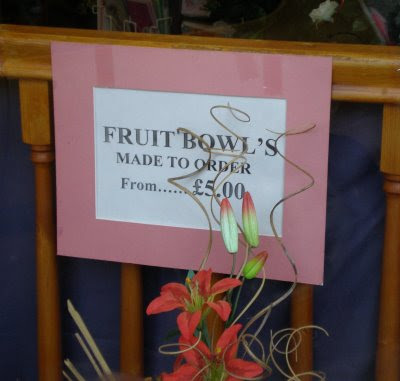 Lorraine from Scotland recently sent me several apostrophe catastrophes that she found in Aberdeenshire. So, today is your lucky day, readers. We've got a three-for-one special on punctuation errors. 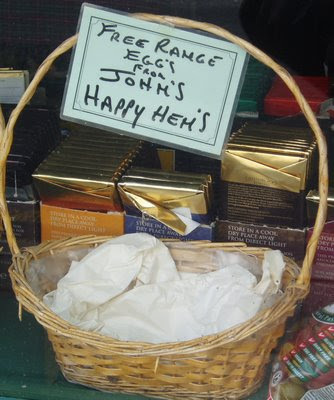 Lorraine tells us that she spotted this basket in the village near Balmoral Castle where the Queen spends her summers. "I hope she didn't see this!" Lorraine writes. 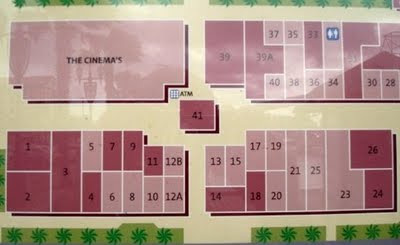 The person who made this sign also seems to have problems forming his or her n's. Lorraine's husband, Doug, and her friend Lorna are posing in the photo to point out the mistake. My eyes hurt. I think I need some Irn-Bru to cure this bad-punctuation hangover. 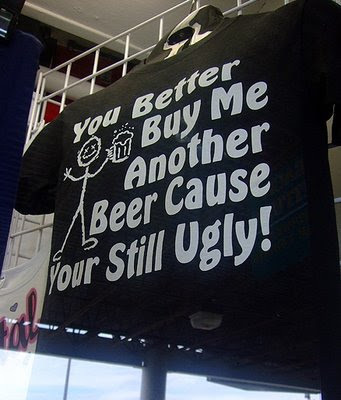 There's not enough beer in the world to make me mix up your and you're. I'm not sure what Hotel Lobby is, but it reminds me of "Ignition (Remix)." But even R. Kelly probably uses better punctuation than this. Thanks, Molly! 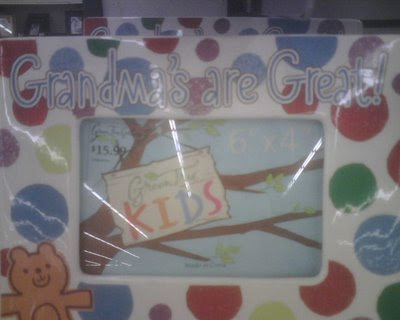 That picture frame is a hot mess. And it costs $16? You'd have to pay me to get anywhere near that thing. Update: Oops, that should be Hobby Lobby. That's what Molly wrote in her e-mail, but clearly I am illiterate. 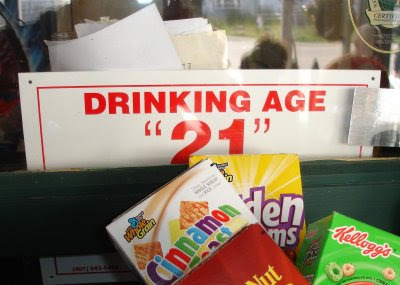 If only I had known about that place when I was 19! They'll make you pay in sexual favors. OK, enough with the quotation mark digression. Back to apostrophes tomorrow. 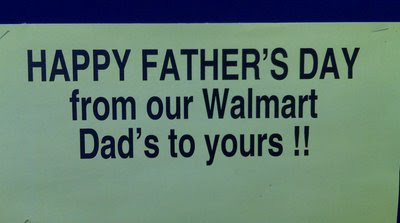 Two Father's Day-related apostrophe catastrophes from Walmart? What are the odds? Pretty high, I suppose. I was excited to receive an apostrophe catastrophe from Thermopolis, Wyoming, where my family and I spent the 4th of July in 1996. The hot springs were amazing! Charles was there recently to meet the officiant for his wedding. 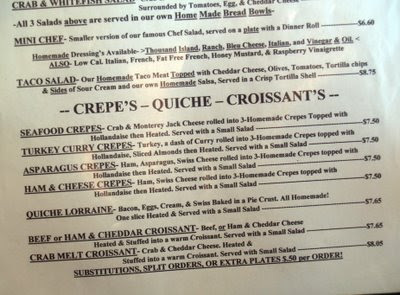 He writes, "Here's a snap of the menu at Pumpernick's Family Restaurant in Thermopolis, Wyoming. Finding the apostrophe catastrophes is a game to keep you occupied while you wait for the waitress. 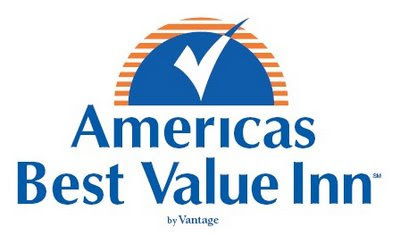 (Luckily, the service was speedy.)" The food sounds good, but I counted three apostrophe catastrophes in about five seconds. 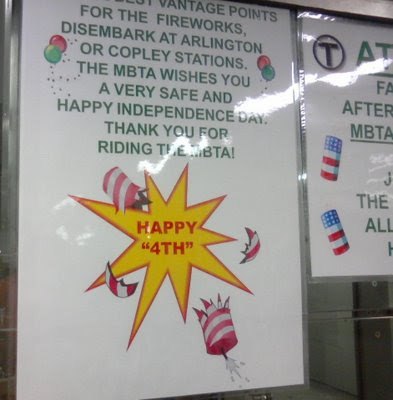 This sign in the Kenmore T station in Boston would have made sense if the fireworks had been postponed until the 5th of July, I suppose. But finally, after almost a month straight of monsoon conditions, the rain stopped, and Boston was able to hold its famous fireworks display, complete with a performance by Neil Diamond. 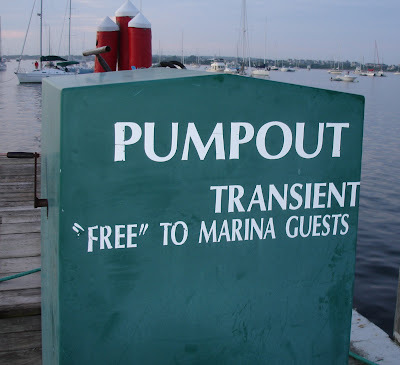 This blog specializes in apostrophe errors, obviously, but if you want to double your fun, check out the "blog" of "unnecessary" quotation marks. 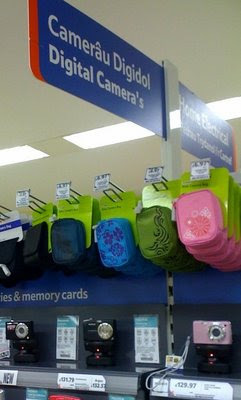 Apparently, it's not unusual to find apostrophe catastrophes in Wales. (Sorry.) Here's another punctuation error from the man who sent us the most bizarre way to screw up your ever.